Solstice Scents is proud to offer gardenia essence from our homegrown pesticide-free gardenia flowers. Only a limited quantity of .25 ml premium perfume samples will be available. See diagram below for fill level. Three different gardenia varieties (Gardenia jasminoides, Gardenia brighamii and Gardenia radicans) were used to create this 100% natural essence. Utilizing the principles of the centuries-old practice of enfleurage, we developed a unique technique to capture the fragrance of creamy white gardenia flowers in full bloom. 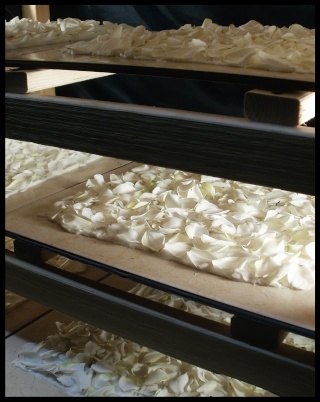 Enfleurage requires thousands upon thousands of gardenia petals to be infused in fat (vegetable source). Each tray takes multiple infusions and the petals must be replaced frequently. It is a very laborious process and this first step mandates a minimum of 6 weeks of dedication during the gardenia blooming season, which occurs mid-April to the beginning of June. The flowers are hand-harvested each morning for maximum potency. The premium samples offered on this listing are from our 2012 batch of flowers. 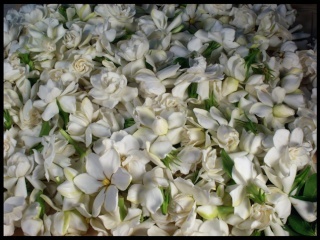 We are currently working on enfleuraging the gardenias that are now blooming and the 2013 batch will be available in the future. Due to the amount of time, effort and dedication required in this process, enfleurage is rarely practiced today. 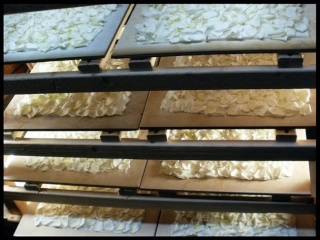 Processing thousands of petals only yields a very small amount of precious absolute, making it impractical for the commercial market. It is a true labor of love. 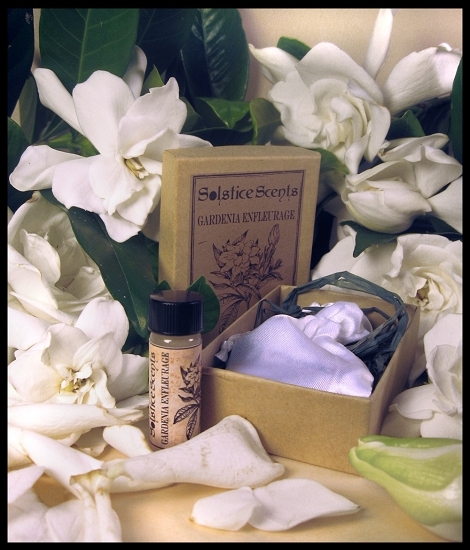 Solstice Scents is one of only a few companies in the world to offer this rare fragrance. This highly concentrated perfume is milky white in color and presented in perfumer's alcohol. 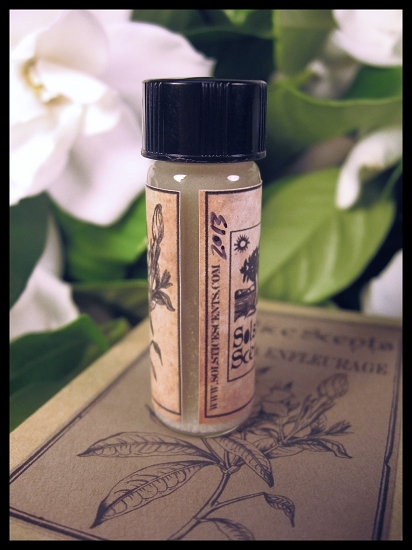 You'll experience a strong burst of gardenia on initial application. The aroma of the gardenia flower is unable to be extracted through the process of steam distillation meaning that there is no such thing as gardenia essential oil. 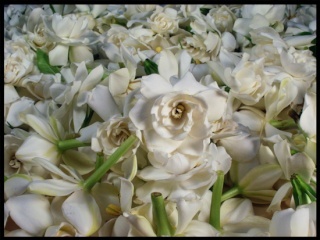 In the rare instances gardenia is offered in the marketplace, it is a solvent extracted absolute or concrete that does not capture the true aroma of the flower. The solvent extraction process degrades the delicate fragrance and yields a product that does resemble a gardenia aroma with much heavier green notes but is nowhere near as realistic as the gardenia aroma produced via enfleurage. Our process captures the character of the flower as closely as possible, exuding the sweetness of the velvety white petals with a very delicate and subtle green note. 1. This sample yields several uses. Settling will occur. Shake vial before application. 2. Apply liberally to posterior of arm/wrist, as opposed to pulse point of wrist, for maximum longevity. 3. Application to skin directly from vial is more effective than multiple swipes of wand applicator and will give you a stronger, longer lasting fragrance. Applying directly to the spot of choice and gently rubbing into skin with finger is highly recommended instead of applying to a spot and rubbing wrists/arms together. 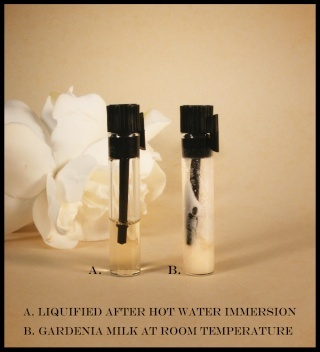 This method allows for the gardenia essence to be highly concentrated in one spot and it will last much longer with this application technique. This fragrance may solidify in very very cold temperatures. Should this occur, you may hold the vial vertically in a hot water bath for approximately 5 to 6 seconds and perfume will liquify quickly. Make sure water does not come near cap or get into the vial. You may also wish to liquify your essence when you have used most of it up so that you can capture any of the remaining floral wax that clings to the side of the glass. An image of the room temperature versus liquified essence has been inserted below for reference. It is NOT necessary or recommended to liquify your essence for every use. Quite frankly, this is one of the most beautiful and pure gardenia scents I have ever smelled. I didn't want to try it because I don't want to use it up, but today I braved myself and put some on. I'm in love. In. Love. It lasted about 4 hours on the skin, with very faint whispers still trailing behind. This was such a labor of love, I'm so happy to have the chance to try it. It's like everyone says, absolutely gorgeous. The meticulous description of the process and wonderful photos really help me appreciate how truly wonderful and special this is. It's experiencing a bit of perfume history by artisans passionate about their craft. What really surprised me was how long it lasted--due to the natural process and components I was prepared for it to be beautiful, but fleeting. I could easily smell it for several hours, longer than some synthetic perfumes. Bravo! Gardenia Enfleurage is quite extraordinary on so many levels. I cannot emphasise this enough to readers. In many respects I struggle to find the appropriate words to describe this gem being offered. Firstly, the scent of gardenia flowers is something many people from temperate climates take for granted as the plant is commonly found in many gardens. While we tend to think of gardenias as a pristine, white beautiful lovely smelling flower that will scent an entire room with only one flower, they are in fact a night flowering genus that pump out scent best in the evening and night time to attract nocturnal pollinators. Hence the white flower and the strong fragrance for low light conditions. So start thinking of gardenia as an evening or night time fragrance for wearing as opposed to a daytime scent. You may be surprised just how appropriate and wonderful it actually is. Secondly, Gardenia scents in perfumes are extraordinarily difficult to recreate. Many perfume houses have a gardenia offering, but so few even come close to capturing the true scent. Tom Ford, in a now discontinued fragrance (Velvet Gardenia) managed to capture the slightly earthy, funky mushroom note that pervades some of the larger flowers. This gave a true to life aspect to the fragrance, but many people found it off putting. Serge Lutens captures some of the aspect of fading yellow/brown flowers as the flowers last wilt in Une Voix Noire. Both fragrances are wonderful, but not entirely true to the flower. Certainly with the Lutens offering the gardenia is only one component of a complex perfume and is sometimes difficult to untangle. Other companies offer "gardenia" fragrances that really don't smell like the real deal and sadly are heavy and cloying. Not the case with Gardenia Enflourage at all. Solstice Scents has very cleverly (in my opinion) bypassed the conundrum of trying to recreate an aspect of the fragrance, by capturing the actual perfume of real flowers in the ancient art of enfleurage. I absolutely applaud this extraordinary effort. Having almost entirely vanished in the 20th century due to the prohibitive labour costs needed for this enfleurage process, Solstice Scents offer (as 'rinster' so rightly says) this labour of love that links us directly to the world of 19th century perfumes. Having read the effort that it has taken Angela and Greg to create this beauty, you cannot ever complain about the price. So what do I smell? I have a number of gardenia flowers from my garden next to me for comparison. Firstly it is a TRUE gardenia scent. It is not quite like smelling the actual flower as it is a combination of three different varieties of gardenia, and the 'mushroom' note is nearly undetectable (for the better in my opinion). The Gardenia jasminoides seems to the the strongest component (that is one of the flowers I have to compare and ensure authenticity), but the other two varieties also add their characteristics to GE in a lovely manner. The Gardenia jasminoides is what gives the jasmine note in this fragrance. I am actually quite astounded how lovely it is. GE fragrance is by no means ephemeral, but is also not at all overwhelming or bombastic - which cannot always cannot be said about the real flower. There are many people who find gardenias too strong for inside the house. For a natural fragrance it is surprisingly long lived. On my old, male, dry skin it is still clearly there at the three hour mark. So I have to say the strength seems perfect. I am certain that many will have no trouble in reaching the four hour mark. I am mentioning this, because (like other reviewers), I am aware of the fragility and short life of many natural scents. Glorious, naturally beautiful and absolutely feminine. It redefines romantic. This is the sort of fragrance offering that every perfume lover should be acquiring because of it's rarity, exclusivity and beauty. I hesitate to say "once in a lifetime', but it is probably true. For floral perfume lovers, this is a benchmark offering not to be missed.